Amanda: What are some of the most important takeaways (in regards to developing musicianship) to learning Jazz? Ali: Jazz training is all about ear training. Whenever I’m talking to a group of classical players describing what the most basic differences between Classical and Jazz are, one of the first topics that always comes up is that with classical music, of course, you are reading music that has been thoroughly composed. In Jazz, much of it, you are playing by ear. As a Jazz player, that is what my training is all about. It’s training my ears to hear intervals, to hear chord progressions, and to be able to play well with others. Jazz also hones our rhythmic skills because of the fact that everything is not just intellectually understood, one has to feel the rhythms in order to really be able to play them. And all of this is from a firsthand experience. It’s not just a line I give my students! The rhythmic aspect of it all – I know that my skill in reading rhythms, my ability to understand and digest tricky rhythms, whether it’s Classical or Jazz, has been improved by being a Jazz player. And of course, the ear training, as I mentioned a moment ago, ultimately extends to any type of ensemble playing, Classical or Jazz. In other words, when you are a student first learning an instrument, all you can concentrate on is what you are doing. It’s very difficult to take anything else in, but as a Jazz player, that’s an essential skill. You have to be able to take everything in because that, in fact, is often your best resource for what you are going to play, in a very real sense. Naturally, you come up with your own ideas, but very often, what you play is a reaction to what somebody else plays. Whether it be rhythmically, melodically, or harmonically, and you need to be able to react to it immediately. So, you really are training your aural reflexes all the time. Amanda: There are so many valuable skills that Jazz teaches. Should Jazz be integrated to collegiate study, do you think? Why? Ali: By it’s very nature, improvisation is a creative process, and I believe bringing a sense of creativity into one’s musical life is also going to improve the classical player. I think every musician should study Jazz because it provides valuable ear training. Being able to hear intervals results in better intonation. Being able to hear a melody and reproduce it without music—to know how that melody has been constructed or how the harmony relates to it—makes us better musicians. The more we know about the nuts and bolts of music, the better the musician. It’s the rare player who claims to be playing just by ear. All of the musicians I play with know a lot about music. Great classical players also know about music. But that sometimes is the divide with the mediocre classical player and a great player. And if you look at all the greats – whether it’s a conductor, whether it’s the concert master, or the principal flutist…Julie Baker, for example—believe me—he knew about music. All the people we idolize, they really do know about music, and Jazz players have that advantage because we HAVE to study it. We can’t go to theory class in college and barely pass, and then expect to become a good Jazz player. But, the good news for someone at college is that theory classes in Jazz are instantly applicable. You go to a theory class when you are studying to become an orchestral player, you are studying figured bass and who remembers that? Nothing seems applicable when you are studying theory as a classical player, or at least that was always the feeling I had. But studying theory as it relates to Jazz and improvisation and understanding harmony, and how it relates directly to a chord progression and why a chord progression works – now THAT is interesting. I think that would be a big shift in college if theory was taught in terms of Jazz as opposed to this historic approach to harmony that is not as immediately applicable to Classical music. Seriously, I think I hated theory when I was in college. It had nothing to do with chord changes! Ali: I know. I didn’t really understand voice leading until I was a Jazz player. Another skill I believe jazz training strengthens is our ability to memorize. Because most Jazz players I know end up memorizing the standards that they play, they are going to feel comfortable playing on a tune like “Have You Met Miss Jones?”, a jazz standard with a famously challenging chord progression on its bridge. Jazz players learn to easily commit to memory the melodies and chord progressions. And we all play better when we are not reading, including classical players. But flute players are not typically trained to memorize. It’s not usually a part of our formal training. String instruments, yes… pianists even more so, are trained to memorize. If you memorize something, you really know it. Again, it’s ear training. And it’s understanding form. We don’t think about form while performing Classical music, but in Jazz you have to think about form. That’s the first step towards memorizing anything. Ali: I have given so many workshops for musicians of all ages, adults – including great classical flutists – and students of all ages. I begin with “how many of you have ever improvised?” and a smattering of hands will go up. Then, I will pick someone who hasn’t raised their hand and ask them “Did you have a conversation with your friend today?” I ask if they were reading a script or if they just said, “Hey, how are you doing, are you going to the game tonight?” or “Do we have rehearsal?” I’ll ask them if they knew they were going to say that in advance or if they were reading it. Of course not! They are improvising! You are just using the English language, or whatever language you speak. Jazz is the same thing, it’s simply a different language. So, the number one thing I suggest is, of course, to listen to some Jazz. You have to have some sense of what Jazz is, what it sounds like. Then, the first thing that I explain and demonstrate, and then have them listen for, is the swing feel. Then we move on to the Blues. The reason is because the Blues is very accessible. In fact, before the end of any of these workshops, I get everybody improvising on the Blues. I have everyone play at the same time so that nobody feels embarrassed by what they can or can’t do. I also have the backing tracks, or a piano player (if I’m lucky!). The main objective of any of my workshops, any of my teachings, whether it’s a workshop, the book, my masterclasses or the DVD, is to create a connection between their ears and what they are doing with their flute. Improvisation is hearing something and then playing it. It’s never the other way around. If you are a good player, you really do hear it first. The training is all about expanding what you hear. The more you understand, the more you will hear, the more you can put into your toolbox. Amanda: When did you decide to focus on Jazz? Ali: I grew up in a musical family. My father, Art Ryerson, was a renowned Jazz guitarist, who got his start during the Big Band Era, with the Paul Whiteman Orchestra, and later became one of the top studio musicians in NYC, having recorded with everyone from Louis Armstrong to Charlie Parker, and Elvis Presley to Frank Sinatra. I have three older brothers, all of whom are musicians. They all played piano and either trumpet or trombone. I began studying piano when I was five, flute when I was eight. Although everything I studied at that time was Classical, Jazz is all I heard around the house. I started improvising well before I was a teenager, and even played in our family band. I was supported, I was encouraged. It was the perfect storm to become a Jazz player! Amanda: Did your classical teachers teach you or did your family teach you? Ali: As far as Jazz, I learned nothing about Jazz from any of my teachers. Nothing. Everything I learned about jazz I learned by playing with my brothers, and later, on the gigs. I didn’t study Jazz when I was young, I just learned by doing. I knew when I was 11 that I was going to be a flute player, and my first Jazz gig was when I was 15. I think I envisioned myself at that time as both a Jazz and a classical player. My Jazz focus happened when I got my first full-time gig on the road when I was 20 with a touring show-band. It wasn’t totally a Jazz gig but half of what we played was Jazz. All the musicians in the band were Jazz players. When I was 25, I went back to school, the Hartt School of Music, shortly after I had taken a masterclass with Julie Baker — Julius, of course, but everyone who knew him called him Julie – and hearing him play for the first time changed my life. He became my God, in a way. I just loved his playing, his sound, his phrasing, and his approach to music. So, I began thinking, maybe I should become an orchestral player. I went back to school, but even while I was at school, I was working, doing both Classical and Jazz gigs. I’ve never had a break from playing gigs since I was 20 years old. I had a Jazz group with one of my brothers, I was also in the symphony and had a chamber group. I think what ended up happening, in the mid ‘80s, I got my first tour in Europe and then my first recording in London. My recording career started in 1985. My entire discography is in the Jazz genre. I’ve released over two dozen albums, plus numerous guest appearances on other artists’ albums. I think because my career in recording and touring is almost exclusively in Jazz, I’m known more as a Jazz player. But in fact, I have two musical families: the flute world and the jazz world. I must like improvising my life too! It suits my personality very well. Amanda: Your work as a Jazz educator has certainly been influential in the flute community! Ali: Thank you! When I started teaching my weeklong masterclass at Hidden Valley in California 15 years ago, it was definitely a turning point for me and my students. They became my inspiration to write my “Jazz Flute Practice Method”. Hidden Valley is also where I developed the Jazz Flute Big Band for my students. It turned out to be the perfect setting for aspiring jazz flutists to play in a jazz ensemble, with good jazz arrangements and a professional rhythm section. When I became the NFA Jazz Chair in 2005, I proposed that we introduce this same type of ensemble to our annual conventions. When I got the green light from the NFA board, the JFBB really took off within the flute community! The immense support that I’ve gotten from NFA [National Flute Association]—starting the Jazz flute big band, being the Jazz chair, and now as Low flutes chair—seems to have changed the face of Jazz flute at NFA, not just for me, but for all the jazz flute enthusiasts. By starting the Jazz flute big band at NFA, it created a presence and a vehicle for all of these flute players to come out of the woodwork and say, “Yeah, we love to do this!” I am very grateful to the NFA for supporting my jazz initiatives, so all this could happen for all of us. Being a part of the NFA has also sparked my composing career. Many of my flutist friends began asking me to write for low flute ensembles, and I think it’s worked out beautifully! At every convention since 2013, I’ve premiered several of my new works. It’s been delightful to be accepted, embraced, and respected by the classical flute community. Last week, I got an invitation from the Rochester Flute Association, they are bringing me back as guest artist in 2018. And in July, I was one of the guest artists performing at the Galway Flute Festival in Switzerland, and I taught a jazz workshop for Sir James Galway and his students! Amanda: On that note, do you have any projects on the horizon that you want to mention? There are two other publishing-related projects—one with Danny Dorff. Although we didn’t know each other when we were kids, we discovered that we grew up a block apart (until I turned three, and I moved). Danny came to one of my Jazz workshops in Philadelphia a few years ago, and we started talking about doing a new ‘how to’ book, but everything that is not in my Jazz flute method book. In other words, for classical players, a “how do you do all of this” kind of book! An ongoing project, or projects, are the Jazz flute big bands that are being created all over the world! I worked with one last year in Japan, and Yuko Hoshi has invited me back in 2020. Another in Ireland also contacted me for music and they want to invite me to be a guest. In Calgary there is a big band starting with a friend of mine, John Reid. And of course there’s Billy Kerr who’s now leading the NFA Jazz Flute Big Band. He is moving to Montreal and he wants to start one up there. They are just offshoots from the Jazz Flute Big Band which started at my masterclass in 2002. A long-term project I have is to score some orchestral Jazz pieces or Brazilian music with solo flute, but I want to write them myself. I’ve done some of that (jazz soloist with orchestras) but I always had somebody else write the arrangements. That’s going to be really long term project! Ali Ryerson has carried on the family tradition, becoming an international touring/recording artist, with performances ranging from Carnegie Hall to the Blue Note to festival appearances worldwide. Ryerson has released nearly two-dozen albums as leader or co-leader on major jazz labels such as Concord Records, DMP, Capri, and legendary jazz producer Bob Thiele’s Red Baron. She has recorded and/or performed with jazz greats such as Stephane Grappelli, Red Rodney, Roy Haynes, Hubert Laws, Mike Mainieri, Art Farmer, Kenny Barron, Frank Wess, and Joe Beck, as well as classical artists Julius Baker, Luciano Pavarotti (while principal flutist with the Monterey Bay Orchestra), and harpsichord master Anthony Newman. Ali was musical director of the Hudson River Regional Jazz Festival (2001-’04), Jazz chair of the National Flute Association (2005-’10), Low Flutes Chair of NFA (current) and founder of the NFA Jazz Flute Big Band. 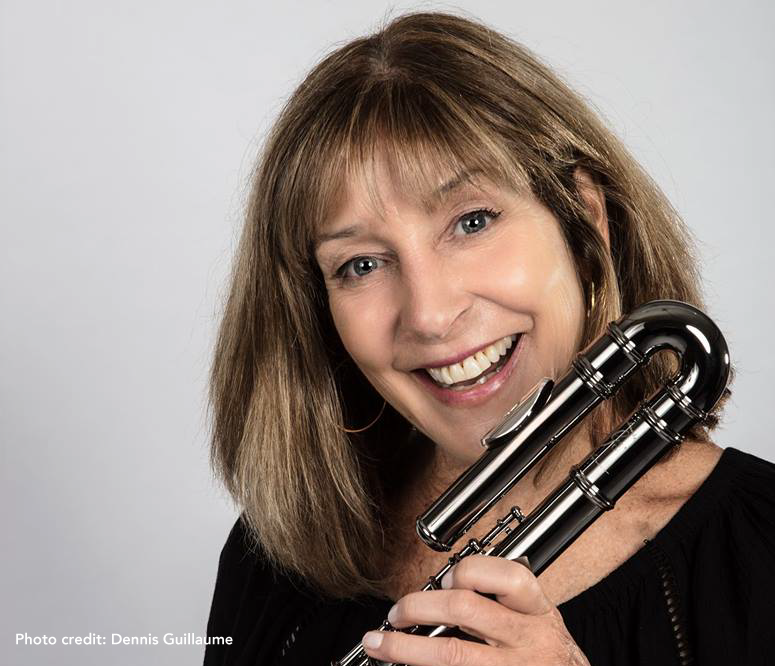 As an educator/author, Ryerson published her widely acclaimed Jazz Flute Practice Method book in ’09, just released her Jazz Flute Masterclass DVD (Lessonface), and has written numerous instructional articles for The Flutist Quarterly, Downbeat Magazine, and Flute Talk, among others. Ms. Ryerson recently joined the faculty at Sacred Heart University in Fairfield CT as Flute Professor, and continues to conduct master classes worldwide, including her week-long annual master class held at Hidden Valley Music Seminars in California. Ms. Ryerson has been on the faculty of the Litchfield Jazz Camp, the IJAM JAZZ summer camp in Italy, is a visiting faculty member at The Jazzschool in Berkeley, CA and a visiting artist-in-residence at universities throughout the US and abroad. She currently teaches an online master class series through LessonFace in NYC. As a composer, Ali has received numerous commissions for flute ensembles. Ms. Ryerson studied flute with Harold Bennett (NY Metropolitan Orch.) and John Wion (NYC Opera Orch. ), and performed at numerous Julius Baker master classes (NY Philharmonic). Ryerson is a graduate of the Hartt School of Music (University of Hartford). A Gemeinhardt Artist with an Autograph Series of flutes she helped design, Ali’s pet project for the past 14 years has been developing her Jazz Flute Big Band, a unique jazz ensemble made up entirely of flutes, ranging from piccolo to contrabass, with a full rhythm section, performing arrangements by some of today’s top jazz arrangers, all commissioned by Ryerson for the JFBB. Their debut CD release, Game Changer – The Ali Ryerson Jazz Flute Big Band (Capri Records ‘13), remained in the TOP 10 on the US Jazz Charts for six straight weeks.